resting gently unto a quarry, ‘the drape’ is an unusual structural coverage developed by architecture and branding àut studio. 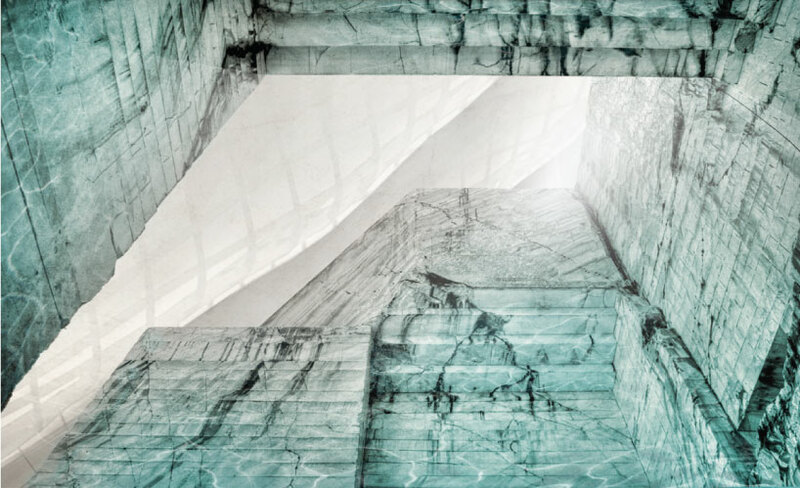 this conceptual prototype, located in italy, is in fact a bathing or ‘wellness’ center composed of indoor/outdoor pools which would be carved into the terraced topography and sheltered by the draping over-top. àut studio0101‘s suspended structure above the quarry covers — but does not cross out — the existing steps, keeping their natural form and creating an ‘in between’ space that is neither internal or external. the surface of the site is designed by projecting the lines of force that manifest themselves in the form of two ridges on the roof, and as two incisions on the rock face. 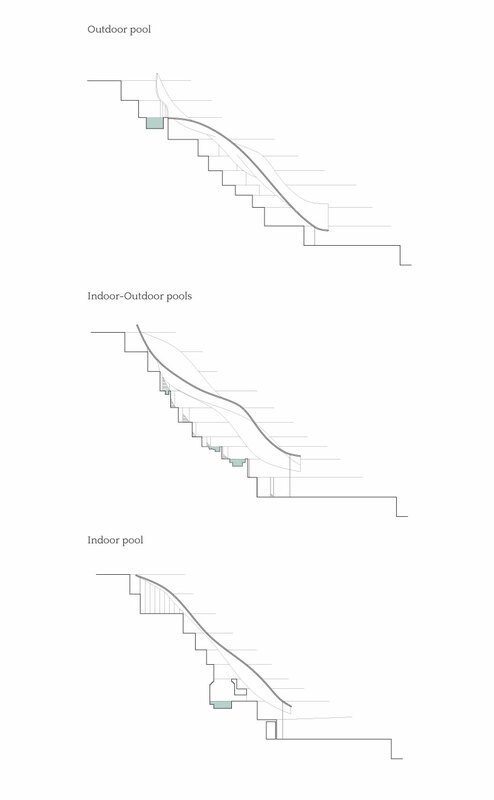 the latter embraces the distribution systems, stairs and elevators that connect the two entry points. 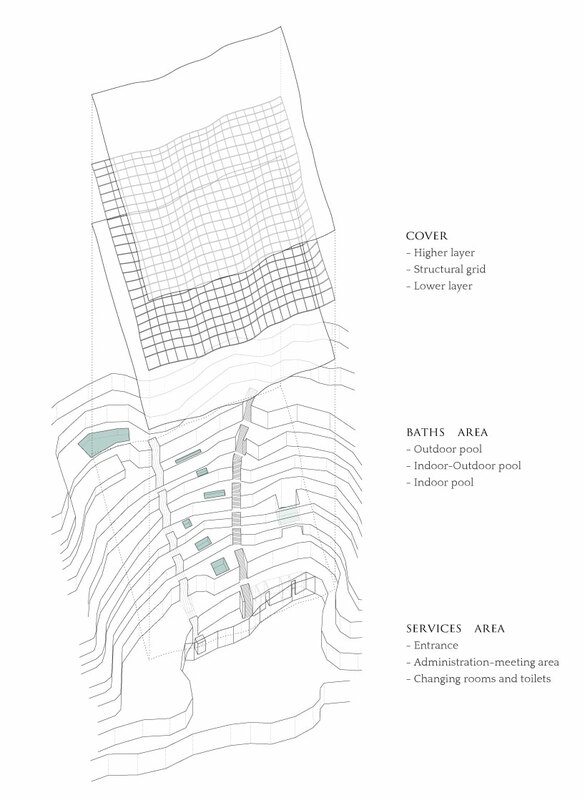 within the structure, three thermal systems are created: one indoor, at lower altitude, built inside an existing cave; an indoor/outdoor made from pools of different sizes and altitudes; finally an outdoor, which is a single pool located at the highest point — in continuity with the coverage that allows a privileged view over the valley. one significant characteristic of the drape is its alternating morphology — depending on the viewer’s vantage point. at the scale of the landscape, the form appears to be natural and embracing the topography; at a closer view, however, it takes on the texture and shape of cloth.